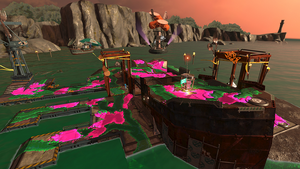 Marooner's Bay is a Salmon Run exclusive online multiplayer stage in Splatoon 2. Marooner's Bay features a large metal ship marooned on a sandbar with its stern having three ramps down onto the beach where there are three piers on the starboard side. During low tide, a sandbar will rise to the fore the ship, revealing a large ring of land and one smaller protrusion. Ship: The majority of the map is comprised of the ship with the highest point, the bow, being the spawn and basket with the ship descending to the rest of the map. The players spawn facing aftwise, so port appears on the right and starboard is on the left. The middle of the ship has a collapsed section with a gap covered by two grate bridges. The center (no grate) and port (grate) parts of the crevice are narrow enough to be cleared with a jump in squid form. The starboard grate is a bit longer and cannot be cleared with a jump. Piers: On the starboard side of the ship leads to three piers. Sandbar: On the port side of the ship is a sandbar area. Propeller lifts: Directly to the port (right) of the ship is a propeller lift from the sandbar and to the starboard (left) is another propeller lift from the pier. Vegetable towers: Corn tower is on the port side sea, asparagus tower is on the starboard sea, and sausage tower is on the sea beyond the stern. All stages have the three floating vegetable-themed towers with different colored searchlights that serve as landmarks. During high tide, only the ship may be accessed with all Salmonids advancing from the stern. During low tide, the shoreline is revealed beyond the bow of the ship. While a Cohock Charge occurs, three Ink Cannons will spawn; one atop the ship, and two on the beach. The internal codename for this stage in the game files is "Shakeship". When the tide changes from low to mid, it is possible for a player to go back to the shoreline and jump onto the low tide egg basket's pedestal. When the water finishes rising, they will be stranded there. This is fixed as of Version 3.2.0. As of Version 3.2.0, the gusher previously closest to the top of the port side propeller lift is removed, and the moving pattern of the Goldie is adjusted. The loadout for the rotation on 21 April, 2018 at 18:00 UTC was Sloshing Machine, Dapple Dualies, Tri-Slosher, and Classic Squiffer, all based on common cleaning supplies in Japan. The fact that this took place on this ship whose Japanese name is Don Burako can be construed as a parody of Momotarō, a popular Japanese folklore that begins with the peach boy protagonist found adrift (donburako) on a river by an old lady who was washing clothes. On some of the kebabs with sausages, there is what appears to be the Squidluminati logo. It is unknown whether or not the Salmonids have a connection with it. Marooner's Bay intro. Sausage tower (pink lights) and Grizzco's boat can be seen beyond the stern. Asparagus tower (blue lights) and the 3 piers seen on the starboard side, left of the basket. Corn tower with yellow lights seen on the port side, right of the basket. Low tide sandbar at the fore of the ship. Corn tower at port; sausage tower beyond the stern. Donburako is the onomatopoeia for a thing (esp. the peach in Momotarō) floating and drifting. This page was last edited on 1 March 2019, at 03:21.